Preterm babies spend their first several weeks of life on the neonatal intensive care unit (NICU). By nature, the NICU is a highly clinical and isolating environment. Furthermore, babies on the NICU are subjected to various painful procedures. The NICU is different from other environments in which full-term infants grow and mature. These differences likely affect brain development. However impersonal and imposing the NICU may seem, babies on the NICU still need lots of love and care. In a 2017 study published in Current Biology, Maitre and colleagues suggest that preterm babies who receive supportive, skin-to-skin touch (including breastfeeding) experience improved brain responses and better neurodevelopmental outcomes. Every year, 15 million preterm infants are born. In 2008, 12.3 percent of all births in the United States were premature or preterm. Preterm babies are born before 37 weeks of gestation. Fortunately, advances and improvements in obstetric and neonatal care have improved survival among premature babies. 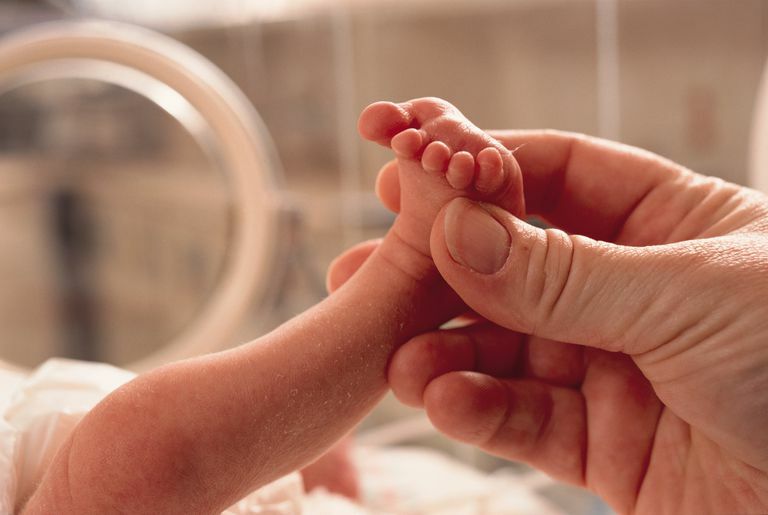 Premature infants and other babies with serious medical issues, such as low birth weight, require care in a distinct portion of the hospital called the NICU. The NICU houses specialized technology and is staffed by highly trained health care professionals. The majority of babies in the NICU are too little or ill to be fed by bottle. Thus, they need to be fed and administered fluids and medications through their blood vessels; IV lines and catheters are placed to provide access to blood circulation. Even if pain medications or sucrose are also administered, these procedures are still painful. Preterm infants have high rates of delays and neurodevelopmental impairments. We know from research that this can be linked to early problems reacting to sensations in daily life. Infants who have difficulties responding to touch, sound, position changes, and sights also have problems with movement, learning language, and higher cognitive skills. More specifically, babies born preterm have a more limited response to gentle touch once they eventually leave the hospital. Preterm infants who receive more supportive touch while in the hospital develop more normal responses to touch once they leave the hospital. In other words, preterm infants who receive gentle skin-to-skin contact while in the NICU are more likely to have responses to gentle touch that are comparable with babies born at full term. On the other hand, premature infants in the NICU who experience painful procedures, like the insertion of needles and catheters, develop abnormal responses to gentle touch. Remember that proper responses to gentle touch are necessary for normal development; supportive touch helps build proper connections in the brains of babies. In infants, touch plays an integral role in sensory-cognitive development and the development of interpersonal interactions. Furthermore, touch is one of the first senses to develop in babies. Full-term babies begin receiving benign tactile stimulation and feedback while in the womb. This feedback occurs during crucial periods of brain development. Preterm babies can miss out on many weeks of such feedback. With sensory systems other than touch, lack of sensory input can lead to permanent deficits. It’s unclear whether the same holds for touch, but it’s possible. We do, however, know that deprivation of touch can impact the lives of preterm infants. "Touch is a critical building block of infant learning. It helps infants learn how to move, discover the world around them, and how to communicate. Touch allows them to learn these skills even before their vision is fully developed, and certainly before they learn verbal skills." In this study, the brain responses of 125 preterm infants (24 to 36 weeks of gestational age) and full-term infants (38 to 42 weeks of gestational age) were examined using a special type of EEG. EEG is used to detect electrical brain activity. Brain responses from full-term babies in the nursery were compared with those of preterm babies in the NICU just before they were about to go home. The researchers first examined the effect of light touch on full-term infants. Brain responses were analyzed after full-term infants were either stimulated using a soft puff of air or a sham puff (i.e., fake puff of air for comparison). The researchers “identified the spatial, temporal, and amplitude characteristics of cortical responses to light touch that differentiate them from sham stimuli in full-term infants” using the latest in topographic analysis tools. In other words, the researchers used the newest technology to figure out how gentle touch normally affects the brain. These data were then used to establish an analytic framework. Using this analytic framework, the researchers determined how the degree of prematurity affected brain response to light touch in preterm babies after stimulation with a puff of air, which simulated light touch. After the researchers controlled for degree of prematurity and pain medication administration, they built on their results to show that light-touch experiences, such as skin-to-skin contact and breastfeeding, are linked to stronger brain responses; whereas painful experiences, such as insertion of a needle or tube, were linked to reduced brain responses. Overall, the results of these studies shed light on how gentle touch may benefit brain scaffolding and contribute to sensory, cognitive, and social development. The results of this study support the importance of gentle and nurturing touch in preterm babies in the NICU. Such experiences help with normal brain development and enable the preterm baby to be discharged from the hospital with brain responses comparable to babies born at term. Normal brain responses likely contribute to later cognitive and social development. Light, gentle, and nurturing touch can likely take several forms, including hugging, breastfeeding and massage. It’s unclear whether this touch must come from the parents; however, when mothers provide such touch, there are also other benefits, including emotional bonding, responsiveness, and other increased health benefits. In a more global sense, such insights could improve care on the NICU. A gap always exists between care as the status quo and care as it should be. Quality improvement on the NICU ensures that preterm babies receive not only the best care on the units but also care that helps them thrive at home. Perhaps formally incorporating gentle touch into the treatment of preterm infants could better prepare them for life after discharge—life at home. Maitre, NL, et al. The Dual Nature of Early-Life Experience on Somatosensory Processing in the Human Infant Brain. Current Biology. 2017; 27: 1048–1054. Raab EL, Kelly LK. Chapter 22. Neonatal Resuscitation. In: DeCherney AH, Nathan L, Laufer N, Roman AS. eds. CURRENT Diagnosis & Treatment: Obstetrics & Gynecology, 11e New York, NY: McGraw-Hill; 2013. Rikken, M. Touch Shapes Preterm Babies’ Brains. March 16, 2017. www.researchgate.net. Smith D, Grover TR. The Newborn Infant. In: Hay WW, Jr., Levin MJ, Deterding RR, Abzug MJ. eds. CURRENT Diagnosis & Treatment Pediatrics, 23e New York, NY: McGraw-Hill. Your Baby Needs a PICC Line: What Are the Benefits and Risks? Do You Understand How Neonatal Care and NICU Levels Differ? What Neonatal Language Terms Should You Know in the NICU? How Is Respiratory Support Implemented for Premature Babies in ICU?